I’ve come to realise that as long as it’s not too cold in the tent, I’m able to get a pretty decent night’s sleep. I also find it easier to enjoy myself, when I can get out of the sleeping bag and get dressed and eat breakfast in a comfortable temperature. I was so grateful that morning, when I had packed down my tent, I turned around and said thank you to the forest. 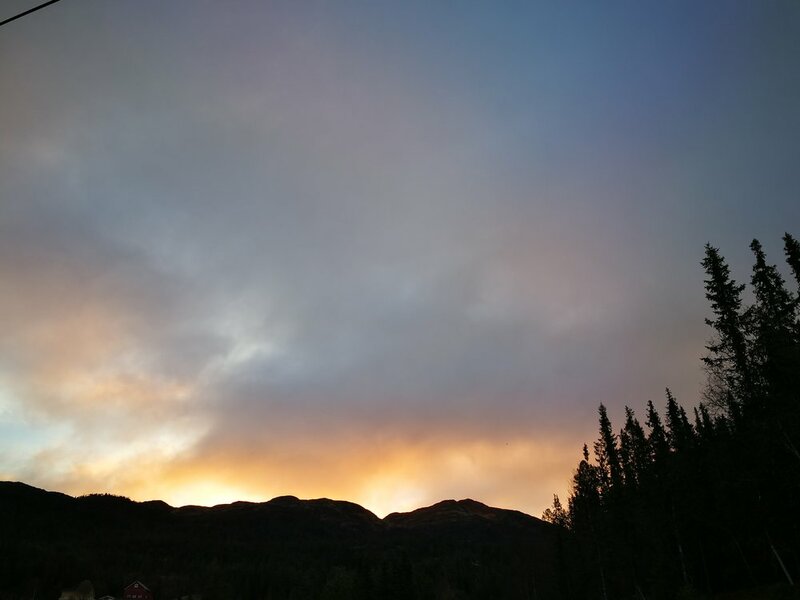 The sky was pale pink and the first beam of sunlight was visible behind the mountain. A glorious morning. I walked down to a mall in Åmot, and as I sat by the socket outlet charging my phone, NRK (the public broadcaster) Telemark called. They wanted to interview me, live on today’s local radio broadcast. You can listen to the interview below. It’s in Norwegian, of course, but the interviewer is asking about my encounter with Chuck Norris the Reindeer and my proposal. I was a bit nervous, but it was fun. Afterwards, I was walking on happy-adrenalin. In the interview, i was bragging about the good weather I have had all through Telemark. I guess I jinxed it pretty hard, because my last hour of walking, the sky opened up. It was a tough ending, up from Dalen it was so steep, the road snaked its way up to 350 meters above sea level. 4 km uphill in pouring rain! If it hadn’t been for my umbrella, I would have been drenched through. When I finally had enough, I found a good spot next to a river and put up the tent. I tried to be super quick, because I had to set up the inner tent first (a downside to my tent, I must admit). At first, I regretted not camping in Dalen, but once I had changed into dry socks and lay in my sleeping bag, I was glad I had started the ascend already. 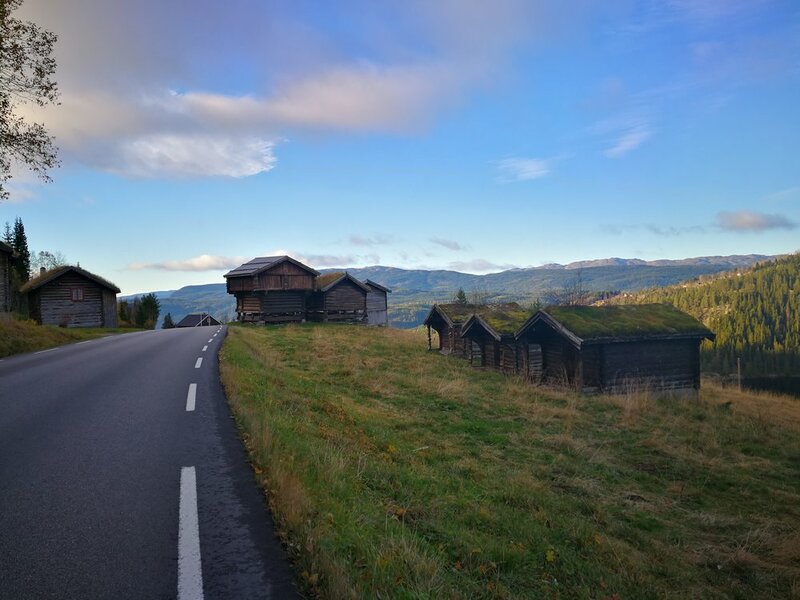 I fell quickly asleep in the comfortable temperature, knowing that I would reach the Bjørnevass cabin the very next day. There, I would be able to dry my tent, so the rain didn’t really matter. It was an overcast and murky morning, and the fog was quite dense too (probably Dementors gliding around), so I didn’t have much of a view. But the fog lifted eventually, and I'm glad, because there were so many beautiful and charming houses around me. I started walking while it was still dark. I put on my headlamp and my reflective safety vest and walked as far outside the road as I could. It didn’t take long before I understood that I had not finished the climb upwards the previous day after all. For two hours, the ascend continued, and my legs were so stiff and heavy, it felt like my pace couldn’t even match a snail. Rain, no rain, rain, no rain, all day long. When I got to the top, I was taken by surprise of some really fierce gusts of wind, that almost destroyed my umbrella. Some days prior to this, I had got a warning to stay indoors, because of the hurricane over Ireland. It was a bit of a struggle to walk against the wind, but it didn’t last too long. To finally reach the cabin, was a true blessing. I hadn’t stayed in a DNT cabin since Jotunheimen, so I felt quite at home. I first got the fireplace going, cleaned my clothes and hung all that was dry over the fire. Then I boiled some water, cleaned my sore feet and ate Chicken Curry. I talked to my boyfriend before going to bed at 8:30 P.M. Again, I fell asleep while reading.